Is your house of worship experiencing any of these? Are monthly energy costs using up more and more of your donations? Does your congregation feel the need for a true sanctuary? 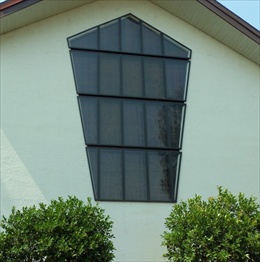 Are your stained glass or lead-camed windows protected from hurricane winds and debris? Do you need vandalism protection? Do any of your members need a shelter from an impending storm? Is your place of worship also a school, community center or other campus? Is your membership recruiting and enthusiasm down among members? Dramatically reduce your monthly heating and cooling costs. Protect expensive or irreplaceable stained glass, photographs and artwork. Stop damage by hailstones, rocks, BBs, pellets or other projectiles. Eliminate window damage from athletic gear during sporting events. Prevent window breakage from grounds maintenance accidents. Protect your windows before, during and after storm conditions. Reduce noises from outside during prayer, school or quiet time. Eliminate places for nesting bird, spiders or stinging insects. Increase donations from community sources from storm shelter capability. provides shelter from hurricanes to those in need, your in house donations will increase. will prompt them to invite their friends to more services and activities. Stained glass protection of a large 14 foot wide X 22 foot tall window. sanctuary that your membership has created. 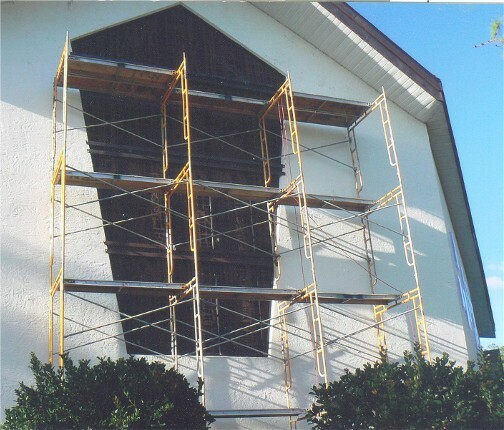 your house of worship can be reaping the benefits of Evolution Hurricane Shutters. Sometimes architecture can’t be sacrificed for the sake of protection. This is where Evolution Hurricane Shutters rise to the occasion.